Learn about the elements that define effective argument and composition through the critical analysis and interpretation of complex texts. Understand the interactions among a writer’s purpose, audience, subject, and genre and how each of these contributes to effective writing. Enhance your own writing skills and understand better each stage of the writing process as you develop expository, analytical, and argumentative compositions. Interested in Taking AP English Language and Composition? Does our school offer AP English Language and Composition? 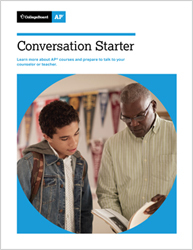 Visit our AP English Language and Composition page.